Argument mapping is the visual display of complex debates. 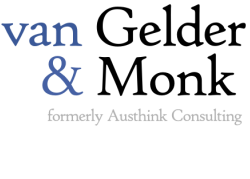 van Gelder & Monk pioneered the application of argument mapping methods to "real world" reasoning and argumentation, and remain the leading specialists in this area. Using our expertise, tools and experience, we can create for you maps bringing clarity and structure to even the most complex, messy and contentious topics. 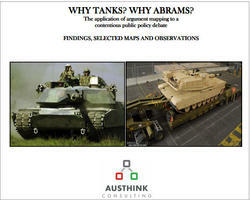 Their methods for dissecting and clarifying complex pieces of analysis or public policy are first class... [Their report on the Abrams tank] is an excellent piece of work and crystal clear in its laying out of every aspect of the debate, for and against the decision. We would be very happy to have a conversation with you about how our argument mapping services might assist you. Working with water expert Prof. John Langford, we created this chart explaining the fundamental reasoning behind the construction of a desalination plant in Victoria. The map is relatively simple compared with many of our engagements but illustrates how producing a diagram can clarify complex reasoning. Tim van Gelder has done foundational work in articulating the discipline of Argument Mapping for real world visual deliberation. Prof. Simon Buckingham Shum, Open University UK.